Opioid Trial: Prosecutors Slam Insys Therapeutics' Tactics Federal prosecutors say the pharmaceutical company paid off doctors and manipulated insurance companies to increase the number of patients taking its opioid Subsys. Insys Therapeutics founder John Kapoor and his co-defendants are accused of racketeering, a charge often applied to drug kingpins and mafia bosses. Two months ago, Paul Lara saw a letter from his doctor to his insurance company. He recalls looking at the bottom of the page, next to the doctor's signature, "It says: Does this patient have cancer? He marked yes." Only one problem: Paul Lara has never had cancer. After decades as a commercial fisherman in Texas, Lara was badly injured on the job. In 2013, his doctor prescribed a high dose of an opioid called Subsys for Lara's back and neck pain. The fentanyl-based spray can be up to 100 times stronger than morphine. Recently, Lara learned the medication is only approved by the Food and Drug Administration for cancer patients who have severe pain despite being on around-the-clock painkillers. "I was shocked. I was really, really shocked," Lara said. Federal prosecutors believe Paul Lara was a victim in a complex scheme by Arizona-based Insys Therapeutics to bribe doctors and lie to insurance companies. 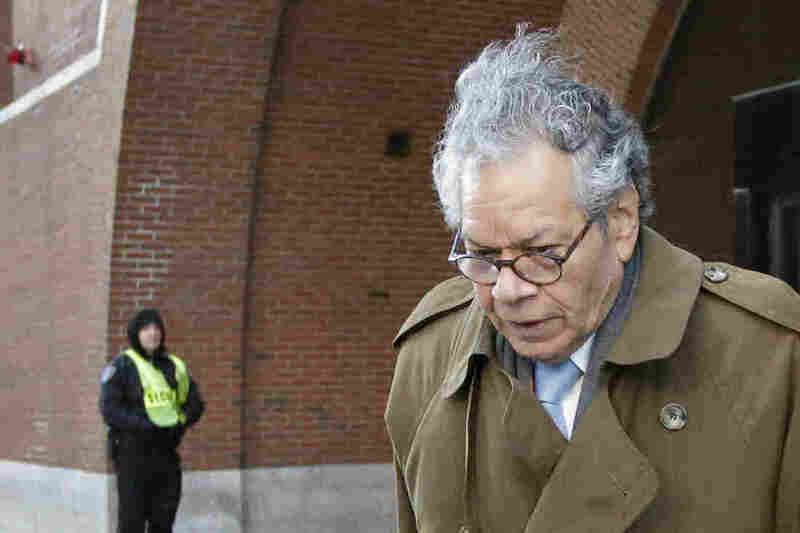 In Boston's federal courthouse, prosecutors spent two months calling witness and laying out their argument in the criminal case against Insys Therapeutics founder and onetime billionaire, John Kapoor, and four of his former employees. The defense could begin presenting its case Monday. If convicted, the opioid entrepreneur could face up to 20 years behind bars. Kapoor and his co-defendants are accused of racketeering, a charge often applied to drug kingpins and mafia bosses. The prosecutors claim Insys Therapeutics set up a phony "speakers program." Often no one showed up for the lectures, but the doctors who gave the lectures were paid handsomely. "But they wouldn't get paid unless they were giving out medication, the Subsys medication," said Paul Lara, who testified for the prosecution. Some doctors made hundreds of thousands of dollars from being "speakers" and, the government alleges, one doctor even received a lap dance from a member of the Insys sales team. For the drug company's sales representatives, higher doses meant higher bonuses. The idea, the government says, was to get patients hooked on the opioid and coming back for more. Insys created this rap video to inspire the sales team. "I got new patients, and I got a lot of them," they rapped to a heavy beat. "I love titrations, and it's not a problem." But having patients wasn't enough, Insys knew it needed the insurance companies to foot the bill, the prosecution said. One month's supply of Subsys can cost tens of thousands of dollars. "This is Kimberly, calling with Dr. Lewis' office." "And Kimberly what is your title there?" "I am a PA specialist." The judge has forbidden both sides from talking about the case. The federal government has painted a picture of Insys executives who put profits over patients' lives. Now that the prosecution has rested its case, it is the defense attorneys' turn to present their arguments. "I suspect one of their principal focuses is to say: 'Wait a second. It may look bad, but folks — this is not a crime. This is government overreach once again,' " said Brad Bailey, a criminal defense attorney in Boston and a former federal and state prosecutor. Bailey is not directly involved in this trial, but he has been following it closely. The judge has said both prosecutors and defense lawyers involved in the case are prohibited from giving interviews during the trial. Bailey's guess is that Kapoor's lawyers will argue that many of the sales techniques — like paying doctors to promote Insys products and prescribing a drug off-label — are common. Bailey predicts the defense attorneys will argue: "This is what you have to do to break into the market and these are marketing techniques that we see across the board." As for the more brazen of the alleged illegal activities? Bailey thinks the defense attorneys will argue that Kapoor and his co-defendants had no knowledge of the schemes. Instead, Bailey predicts, they will say it was all orchestrated by the three former executives — including the CEO and the head of sales — who have already pleaded guilty. In their opening statement, John Kapoor's lawyers say he was motivated to develop the painkiller simply because he saw his wife suffering as she died of breast cancer. Outside the courtroom, Insys Therapeutics is struggling financially. A spokesperson said the drug company may not survive. She attributed the challenges, in large part, to the cost of mounting legal defenses in court cases and possible settlements. "There's no doubt that this entire prosecution is meant to have a deterrent impact and tell other companies: 'Hey, you've got to start taking responsibility for this health crisis,' " says Bailey. He says the federal government also wants the American people to feel like someone is being held accountable for the opioid epidemic.